Lots going on in the world of gluten-free today! Starbucks will now be carrying Kind Bars. If you haven’t tried these bars, you are really missing out. Combinations of fruit & nuts, some with yogurt, too. Most varieties are gluten-free, but watch, there is at least 1 I have seen that has oat bran. The labels clearly state “gluten-free” on the ones that are safe for us. I almost always have 1 of these in my purse, but it is nice to know that there is one more place I can get a gluten-free snack if I need to or want to! First, I must start by saying that I am very grateful to this fabulous company for recognizing that it isn’t necessary to use wheat starch or barley malt in every cereal that they make. There are so many more cereals out there that could easily be converted to a gluten-free recipe if the barley malt flavoring or wheat starch were removed. I know, reformulating is probably not cheap, but think of the increased number of consumers you could reach!! 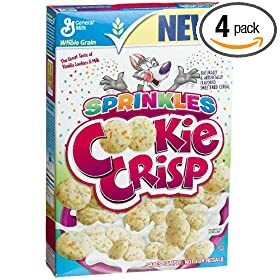 I have not looked yet for the Sprinkles Cookie Crisp in my local store because I just found out about them. I will start to look next time I am in the store. Though, I need another box of cereal like I need a hole in my head. For those who can’t find the cereal locally, our favorite online shopping venue offers up the cereal in cases of 4. **Please note that the Chex cereals are the only ones that are specifically labeled “Gluten-Free”. The others listed contain no gluten ingredients and are enjoyed by many who follow the gluten-free diet. Both Jon & I are extremely sensitive and have had no issues. 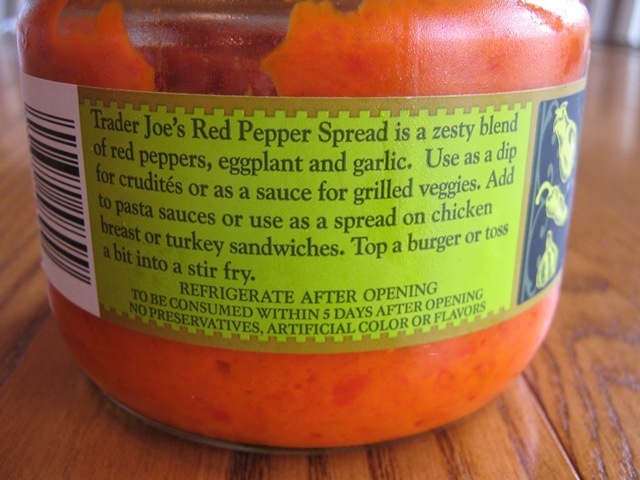 When I was in Trader Joe’s last week, I was looking for some kind of sun-dried tomato sauce or pesto or something like that to spread on toast or bread or burgers. I thought I had seen something like this before there, but I couldn’t find anything like that on this particular day. 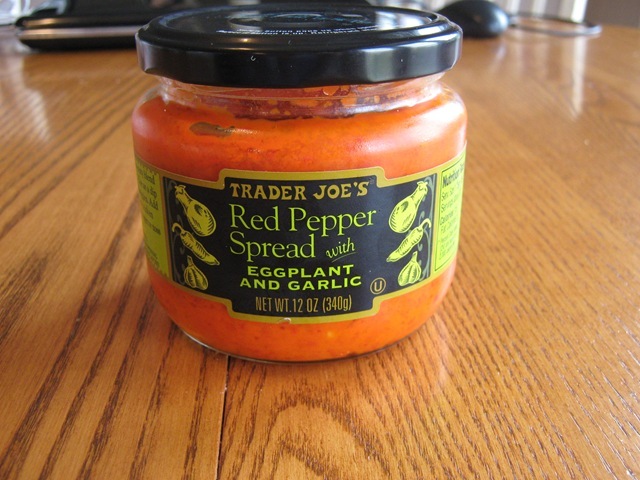 I did find Trader Joe’s Roasted Red Pepper Spread with Eggplant & Garlic. I checked the ingredients and there was no gluten and no onion!!! There were under 10 ingredients (major bonus) and all of them seemed to be “Kim friendly”. 🙂 Another bonus? Under $2! How can you not love Trader Joe’s? I have used this spread now in a dozen ways. I have topped salads with a tablespoon or 2 of this spread & then a tablespoon of plain Greek yogurt. I have spread on a toasted French roll (also from Trader Joe’s). I have topped my turkey burger with the spread & then topped with goat cheese, stuck under the broiler & let it get all melty; then I placed the burger on top of some grilled eggplant slices. I have used on my turkey tacos & Mexican pizzas. I have used on my turkey sandwiches. Really, the possibilities are endless. This would be great to dip foccacia bread into or I bet it would taste great in an omelet or scrambled eggs too! I just now thought of that! I highly recommend this product. 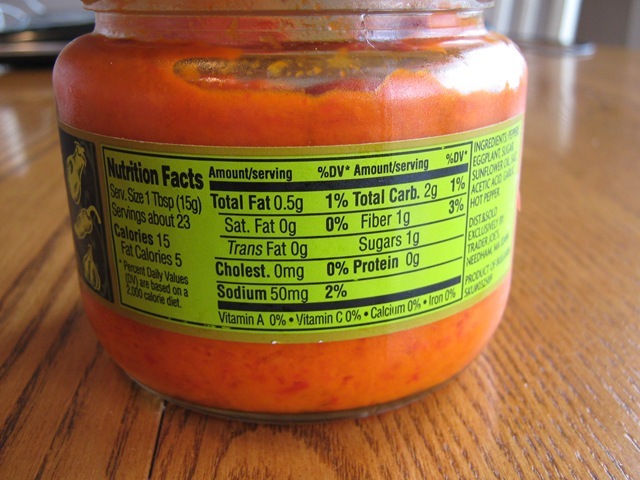 If you are watching what you eat, it is low in calorie, too, at 15 calories/tablespoon and only 0.5 grams of fat. Tonight I had chicken on the menu and wanted to make chicken fingers out of the chicken, but didn’t really want to deep fry or even pan fry them. I didn’t have any breadcrumbs, but did have Rice Chex and had seen that people had suggested using those in place of breadcrumbs. I decided to give it a try. Heat oven to 350 or 375. Cut chicken breasts into strips. Crush cereal & mix the rest of breading mixture together in a large ziplock bag or bowl. Dip chicken strips in milk/egg mixture and then roll around, toss, shake & shimmy them in the breading mixture. Place them on a baking sheet. **I used a baking sheet that was covered in foil, then placed cooling racks on top & sprayed with Pam. I did this so that the chicken fingers would not get soggy when cooking. Repeat until finished. Bake for 15-25 minutes, keeping a close eye. The thicker your strips, the longer it will take to cook through. You may broil on low at the end to brown up a bit if need be, then flip & do the same. I would say 1-2 min. max. I served these with sweet potato hash browns & corn on the cob. The kids & Aaron absolutely raved about these! They said they tasted just like Wendy’s chicken nuggets (not sure if that is a compliment or not 😉 ). I will say that Jon & Aaron were using dipping sauces from Wendy’s that Hannah didn’t use the other day, so maybe that is why. LOL! I didn’t get a picture because they literally ate them faster than I could plate them up. Jon has requested that we have these again tomorrow night! LOL! Maybe not that soon, but definitely a weekly menu item. If you have been reading my blog for any length of time, you know that I love chocolate in any shape or form. I can’t tell you the last time I turned something with chocolate away (unless it had gluten in it). 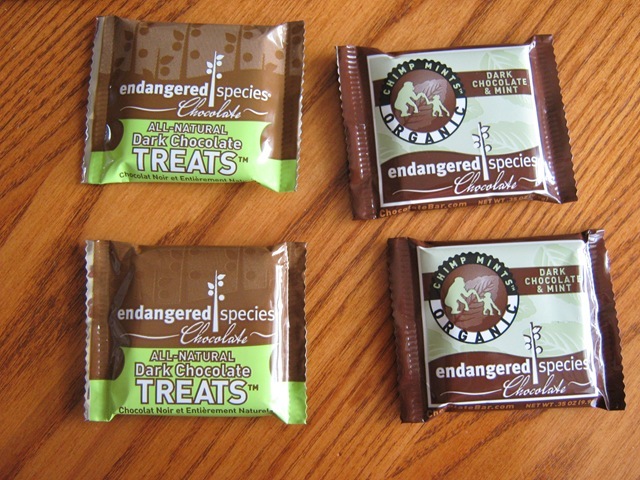 😉 The wonderful people over at Endangered Species Chocolate contacted me a couple weeks back to let me know that all of their chocolate is gluten-free!!! How cool is that? Not only that, but would I like to try some samples. Ummm…….let me think about it. HECK YEAH!!! Yesterday when I got home from the craziness of the morning, I found a nice package on my doorstep. 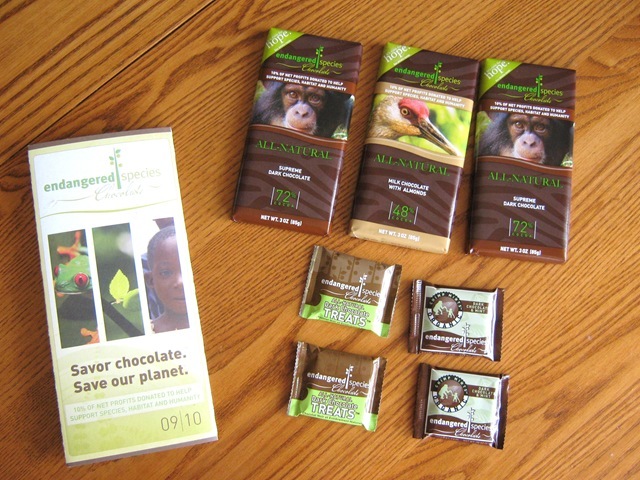 Inside were 3-3oz chocolate bars (2 supreme dark 72% cocoa and 1 milk chocolate w/almonds) and 4-.35 oz chocolate treats (2 dark chocolate mint & 2 dark chocolate). Empowering individuals to create solutions that sustain species, habitat & humanity. My most favorite statement on their brochure? 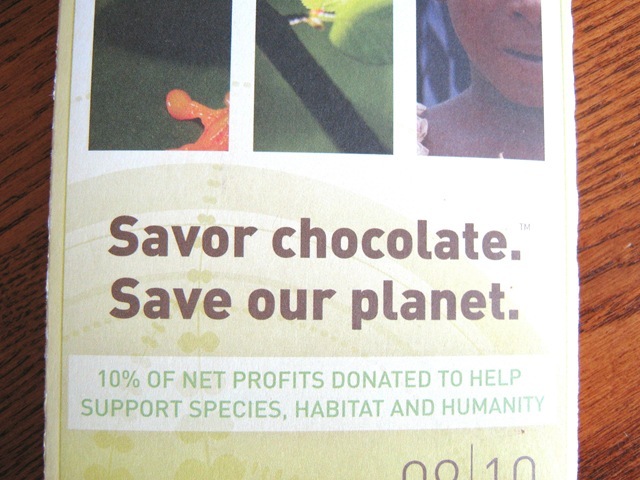 Savor chocolate. Save the planet. Well said. I decided to spread the love with my chocolate. Yes, chocolate is very good when you can have it all to yourself, but not only do you end up over-indulging then, but your friends might not appreciate watching you scarf down a whole bar and not sharing the love. So, I broke out my dark chocolate & milk chocolate w/almond bars after dining with 2 of my BFFs the other night. We all were in love at first taste! Really, how can you go back to Hershey’s (sorry, Special Dark & Dove) you know I love you, but seriously, this stuff is like solid gold (I was going to say liquid gold, but that doesn’t really make a lot of sense if the chocolate isn’t melted, does it? LOL! Such intense flavors, thick bar, amazing aftertaste. It helps that I had 2 other people try is so you all don’t accuse me of liking everything that I try. Yes, I like food and chocolate, especially, but I pride myself on being honest. I know how hard it is to find good, gluten-free foods. 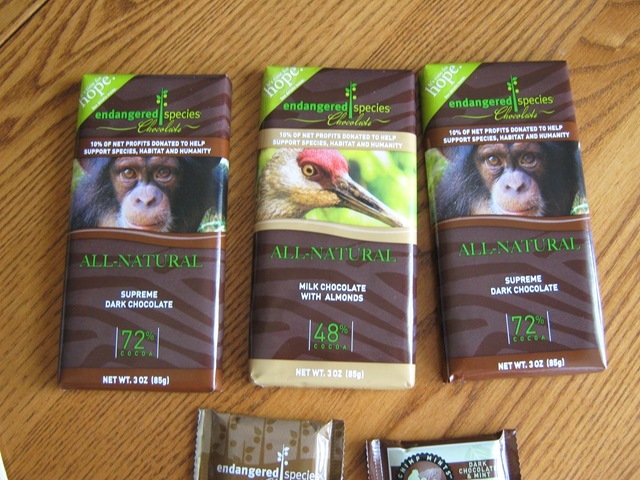 I am editing to add that Endangered Species Chocolate is giving away a year’s worth of free chocolate! Just complete their short survey here. The hot, dog days of summer are here. Humidity is crazy! Feels like you are swimming through the air as you walk. Great pool days, though. 🙂 The kids are loving the daily swimming lessons. I guess the one benefit to this heat is that there are no cold mornings for swimming. Which means no purple lips or chattering teeth! Celiac Family is hosting the Gluten-Free Menu Swap this week and chose the ingredient: balsamic vinegar. I love balsamic vinegar & use it for many different things in my house. I will sometimes use balsamic vinegar alone for my salads. I marinate my chicken breasts in a mix of balsamic, olive oil, basil, oregano, garlic, salt & pepper, then grill. I saute mushrooms in balsamic vinegar. I could go on & on. Oh, one of my favorites is Caprese Salad with a balsamic gastrique (just balsamic & a touch of brown sugar stirred up & drizzled over the salad). Thanks for hosting!